Still reeling from the departure of his first human companions, Barbara and Ian, the Doctor finds himself in a struggle for control with a Time Meddler. This is one of my favorite serials. Everything about this feels correct. The acting, the story, the episode pacing, everything was correct and perfect. Compared to the previous serial of The Chase, this is a far superior serial. It serves as a great introduction to a new companion. It’s also a great episode to introduce any new Classic Who fan to the series if they are merely curious about the program. What’s really great about this episode is that it builds the foundation for Modern Who. We get a glimpse into the world of the Time Lords outside of the view of the Doctor. (Note that the Doctor is not yet named as a Time Lord yet but there is an understanding that the Monk and the Doctor are of the same species.) We get to see that there are different models of the TARDIS and different interpretations of the meaning of “interference”. The Doctor is simply delightful in his interactions with the guest characters. The foundation that is built with Steven and the Doctor is fun and delightful. Overall, I think this was the perfect episode to present after the lackluster serials of The Chase and The Space Museum. I can’t help but wish the energy presented in this serial had been present in the previous two. This was the first introduction of the Meddling Monk, a fellow Time Lord. Like the visual presentation, the book adaptation is a tight, fun story that is highly entertaining. The characters and the action are well-balanced. The writing is crispy and the story flows quite well. I found that I read the adaptation quickly and was never bored with the prose. In the book adaptation of The Chase, Steven is mentioned briefly as having escaped from the burning building, not dead as the Doctor, Barbara, Ian, and Vicki had assumed. The description of how Steven smuggles onto the TARDIS is brief but it does inform the reader that he is on the time vessel. 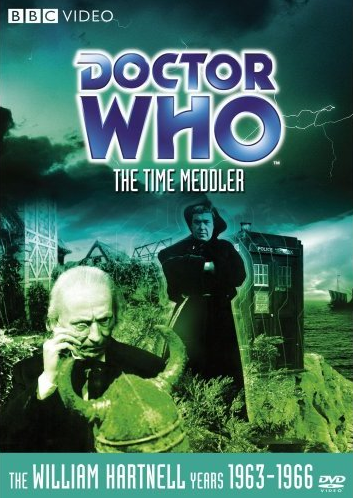 The adaptation of The Time Meddler gives a two-page prologue which gives the reader a bit of a background of how Steven came upon the ship in the first place. It’s a great character introduction and I think it adds to the drama of the adapted storyline.